1st VIC – Bow: R Ernie Dawson, 2: Frank S Gibbs, 3: D Ross, 4: T Davies, 5: Harold Irving, 6: Charles Donald, 7: Harold Lindgren, Str: Alex B Sloan, Cox: Victor Jones. Average weight 11st 4lb. 2nd NSW – Bow: J H T Evans, 2: Edward A Pearson, 3: Henry (Harry) G Williams, 4: N F White, 5: B Sawyer, 6: D Cowan, 7: George A Vivers, Str: Charles H Helsham, Cox: C Lou Quist, Emerg: C H Kloster. Average weight 11st 8lb. 3rd QLD – Bow: W A Douglas, 2: J H Williams, 3: T A Skinner, 4: W B Carmichael, 5: Alick Dennis, 6: J Deevy, 7: R MacAlister, Str: A Young, Cox: W Armstrong, Emerg: J Cannan, Cch: in Bris Francis W DeLittle and in Sydney Messrs Robson and Hall. Average weight 11st 5lb. Victoria led all the way in the eights but were pressured by NSW in the closing stages to win only by a length. Queensland stopped earlier in the race when 10 lengths behind. The amateur definitions were getting closer to resolution by 1896 but not yet settled. The NSW Rowing Association was getting pressure to allow manual labourers to race as it was giving away a significant advantage to the other Colonies whose amateur definitions differentiated only on racing for cash prizes. The matter took until 1899 to resolve. 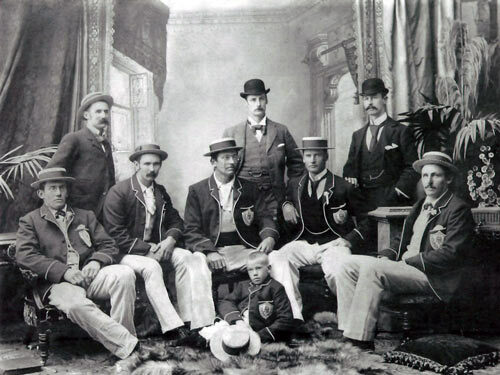 Slack was determined to again win the Sculling Championship after his defeat in 1895. He won easily in the end from Bannister who had moved to NSW following representation for Victoria in earlier years. The conditions were again very rough and it was recorded that Slack won by both skill and endurance. McCormick of Picton New Zealand was selected after Chapman of the Wairewa Club was unable to attend. 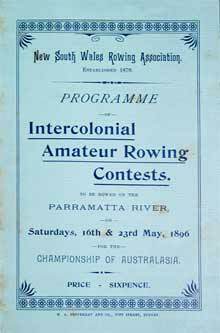 This event was conducted within a week of the intercolonial eight championship at the request of New Zealand who wished to compete against Australian crews. Alan May reports in Sydney Rows that the first eight oared boat in New Zealand was purchased by the Star Boat Club in 1895 and their first eight oared event took place in 1896. NSW objected to the inclusion of two fishermen in the NZ four oared crew and so the Queen's Drive Club crew were withdrawn and the Blenheim Rowing Club selected. The Queens Drive Club crew were the NZ amateur four oared champions. Daly of Canterbury Rowing Club was selected in place of McLean. George Billingsley Richardson in the photo below was not only the coach and manager for the ‘Seymour Crew’, but he was also their cousin He was an ardent rower for Cambridge, which is where he gained his knowledge.